I’ve found that there are two sorts of historical novels. Some use history as the setting, others use it as the story itself. 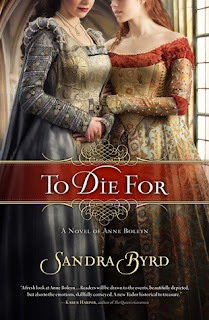 Sandra Byrd’s new novel, To Die For, is an excellent example of the second type and sheds new light on a well-beloved historical event. If you love stories of Anne Boelyn, Henry VIII, Tudor England, the protestant reformation, or even Queen Elizabeth, you don’t want to miss this book. It dives deep into the historical details of King Henry’s court, giving a thorough understanding of the culture, as well as the dangers of the time. Told from the first person point of view of Anne Boelyn’s good friend Meg, this story offers a thorough accounting of the evil and intrigue of the court through a set of untainted eyes, befitting a Christian book. If you’re a fan of Philippa Gregory’s Tudor novels, I think you will love this more innocent and spiritual, although equally artistic version, as well. The language is lovely and the story poignant as we travel with Meg through this treacherous time in history. That being said, I have to admit that I am personally more of a fan of books that use history as a setting than books such as this one that use history as the actual plot. I’ve read Anne’s story too many times, I’m afraid, so it held no surprises for me. However, Meg’s story interwoven through the details of court life and politics definitely kept me turning pages. I found myself always searching for the next update on her struggles, relationships, and romances. And while any history fan is well aware that Anne’s story does not end well, Meg’s has a lovely and satisfying conclusion. My favorite part of this novel was the spiritual aspect. Meg shows true love and faithfulness to Anne, to God, and to the man of her dreams. Although her romance with Will is interrupted by God’s individual calls on their lives, their sacrifices are rewarded and help them to grow in the Lord. I think too often novels put romantic love above all else, so I was pleased to see a novel where serving God and obeying his call received a higher priority. The other spiritual element that really struck me was how valuable the word of God is. We take this for granted, forgetting those who struggled, suffered, and even gave their lives to offer us this amazing treasure. This book puts that into perspective. Have you read any books about Tudor England? Do you like this time period? If so, what stands out to you? This sounds really good, Dina. I also have to confess that I love to step out and "reward" publishers who take a chance on something beyond the American prairies by buying the book! I second that emotion, Lisa. Love the chance for this setting. I'm a super fan of Phillipa Gregory and admit to using her books as partial history lesson. (That Tudor period and all those wives...so confusing!) It also helps that my local library has them all in audio. Thanks for the review, Dina. 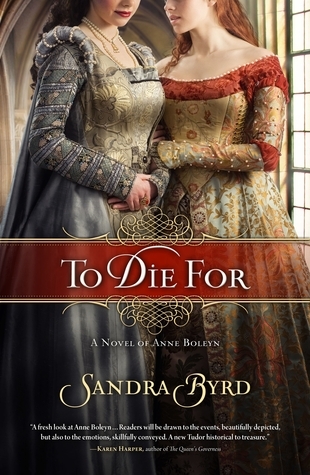 I'd say the cover alone is 'to die for' and I know I'll be buying this book someday. I'm very curious how Sandra creates an Anne who has often been painted as manipulative. What stands out to me is the incredible insecurity anyone had during those years while loyalties and trust changed daily. I agree too. I love to support books set in unusual time and places. I would have bought this one based on the cover alone. And, I too have learned much history from Philippa Gregory. I'm sure I probably drew on pastoral descriptions from her Wideacre series in my own book. This is actually the second version of Anne's story I've read where she is a good, albeit misguided, Christian woman. Ginger Garret has also written one, but hers is more of a supernatural thriller involving time travel. Like some of you ladies have watched all versions of Jane Austen movies, I've read most of the books out there on Tudor and Elizabethan England. okay, well you just sold me on Ginger Garrett, Dina. And yes, I plead guilty as charged for the Austen obsession. Though it could be much worse given the incredible fan-fiction out there. Thank you for the review, Dina. This novel piqued my interest from the first I heard of it, except I can't tell you exactly what struck a chord with me. I'll definitely read it if it crosses my path. Great review, Dina! I've been waiting for this book to come out for quite some time. It sounds so interesting. I loved her last series, contemporary, and it was great. I'm sure this book will be, too. I just finished reading this book. And, yes, it's a great story beautifully written. And, of course, has the most beautiful cover I've seen in a very, very long time. I can't say I was thoroughly convinced by the some of the interpretations the author made about Anne's motives and character or about some events that may or may not have taken place, but it was great fiction. (I do think she was executed, as this book shows, because she was inconvenient, not because she was guilty.) And I, too, really enjoyed the part about bringing the Bible to the people in English. Henry VIII was obviously a very spoiled and out of control person, and it must have been terrifying to be close to him and not know what his mood might be from day to day. That was very well captured in this book, too. Anita, probably the gorgeous cover we've all been raving about. Suzie, this was my first book by Sharon. DeAnna, I guess I don't have very strong opinions about history. Most of Sandra's choices about Anne's motivations were similar to what I read in the Ginger Garret novel, so I wasn't surprised by any of them. I did like very much that they both focused on her role in bringing the Bible to the English people, I never saw that aspect in any of the secular versions I've read. I haven't read Ginger's novel, but history is always open to interpretation. I'm not saying they're necessarily wrong in their interpretations, just that I'm not convinced. I think, being raised in the courts of England and France, Anne knew very much what she wanted and how to get there. And, obviously, she fell victim (even more so) to the same kind of intrigue that raised her in the first place. I am a big fan of Tudor-set books, like Margaret George's Henry VIII and Philippa Gregory's novels, but I've often lamented the lack of inspies set in this period. This sounds like the book for me! I think Lisa's got a point about putting our dollars toward genres we want to see continue in the market. Gorgeous cover. Those gowns! Sigh. Thank you so much for your review, and for having my on your blog today! Lisa and Susanne, you are so right about supporting different genres. I feel that way, too. It's not that what we've got isn't wonderful, it's just the no one wants to eat roast chicken every night. I'm making an effort, too, to buy different books. And speaking of that, if you haven't tried Ginger Garrett's Wolves Among Us, that's one to read. Hi Suzie! I posted a link to one of Lexie's recipes from the French Twist series on my facebook wall today. I'd put some of them on allrecipes, as her, which was fun. Thanks so much for loving those books, and to all who will give To Die For a try. Sandra, I'm so glad you visited today. Lexie's recipes? I'll have to check those out. Yum! Oh, yes, please, we need to support the "other than bonnet books" fiction that's out there when we can. Not that I don't enjoy a good bonnet book, too, but it would be nice to be able to read (and write!) different things. And different things are often a very hard sell. Yay, thanks for stopping by Sandra. I agree with all about buying the books we want to see on the market. When I especially love a book I try to buy extras for gifts too. I do that, too, Dina. I think it's a great way to support authors we love. No, Sandra? and why not? Thanks, Sandra, for not posting the recipe for jellied eel. Some how I don't think that would be as delectable as a French pastry. Um, yeah, I could skip the jellied eel, thank you.